At that point, I thought I was screwed. From what I could tell and from what a travel agent told me, the next available flights were not going to be until today – Boxing Day. Thus I would miss Christmas, stranded in a foreign land. But miraculously, ten minutes later the travel agent called back to report a block of seats on Air Canada flights had opened up. We quickly managed to a book a flight connecting in Ottawa for Wednesday, and despite snow-induced delays on the ground in Ottawa and later in the air above Boston, I made it home for Christmas. We landed in snow, because flakes don’t necessitate entire airport closures. From what I read, Heathrow is still struggling to return to a near-normal schedule. 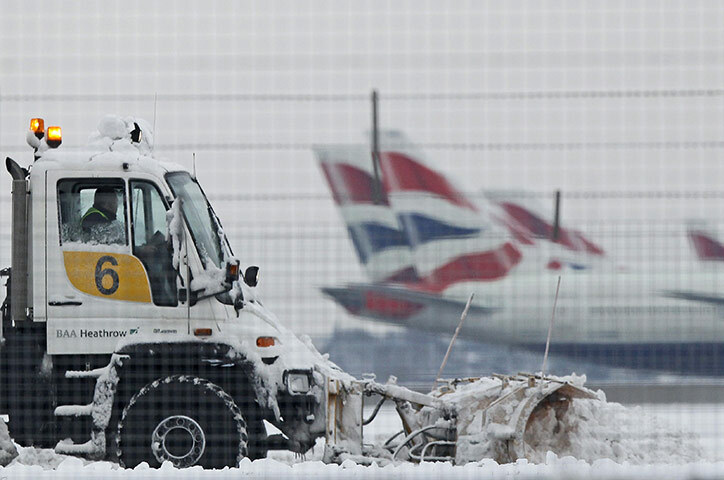 The reasons for this debacle are many: not nearly enough snowclearing equipment (Gatwick, at half the size, has twice the number); a shortage of de-icing fluid; refusal to accept an offer of assistance from the British Army; and a scandalously small sum spent on snow and cold-weather operations improvements in the last year. Plus, the sight of snow itself seems to send the United Kingdom of Great Britain and Northern Ireland into an absolute tizzy. It was an unreal scene. Even getting to the terminal for our Wednesday flight required an hour-long wait outside the terminal, plus one at least as long once we were allowed in. And by that point, the line outside was four times what it had been when we first joined it. This was four days after the snow, and the worst of the terminal refugees had been moved or housed. I can’t even imagine the scene on Sunday or Monday. The entire nation was in panic mode. BBC kept running the headline “FROZEN BRITAIN” and its presenters referred to the “arctic weather” that had beset the country. The Heathrow disaster also speaks to the dangerous nature of privatization: BAA, the company that runs Heathrow and Stansted Airports (but which sold of Gatwick a couple years ago), has virtually no incentive to provide decent service. The British equivalent of the FAA, the Civil Air Administration (CAA), is endowed with few powers to regulate or even fine BAA for its catastrophic performance. What we are witnessing on either side of the Channel is the double whammy of a debt-ridden public sector making cuts wherever it can and a bonus-addicted private sector making cuts wherever it’s profitable — with the resultant disaster foisted on a general public now so cowed and coddled and fearful and risk-averse in the age of terror and technology that an inch or two of snow sends everyone into a blind panic. Britain loves a good crisis, and the sheer lack of resilience on display in the last week is appalling. Britons were told to duck and cover, to stay home and avoid traveling, and the fact that local councils were running out of grit (hint: it’s an island; there’s lots of sand to be found) was simply unbelievable. And rather than keeping calm and carrying on, everyone panicked and freaked out. Keep our chins up, indeed. I have never been so happy in my life to see either Canada or U.S. customs. I wish they still asked you directly if you had anything to declare; Dennis Farina said it best.